Powerful Tesseract Seekers threaten space-time stability as a final attack on four key Tesseracts have commenced. 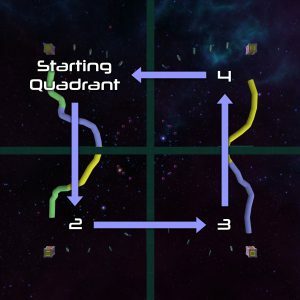 Cycle through the course in the correct direction to defend the Tesseracts and put an end to the invasion. This is a very challenging mission. The field is split up into four quadrants, each with one Tesseract and three Seeker Launchers. The Seekers in this mission are more powerful than normal, and a Tesseract is destroyed after colliding with three of them. Start by destroying the Oculi and the three Seekers that are launched in your starting quadrant. You then work counter-clockwise through the field, going through the tunnels to get to the next quadrant. You will need to be quick, as the Seekers in the next quadrant will be launched fairly rapidly. Once those Seekers are destroyed, travel through to the next quadrant through the tori. Repeat the procedure until time runs out. You can determine which direction to go by always alternating between tunnels and tori to get to the next quadrant.